Following the Soviet occupation of eastern Poland in 1939, some 1.5 million Polish citizens found themselves arrested and transported into Soviet labor camps and prisons. When the Nazi sneak attack struck the Soviet Union 18 months later, British diplomats led by Foreign Secretary Anthony Eden pointed out to the Soviets that these exiles could provide a potent source of manpower for the anti-fascist struggle. Negotiations between the Soviet Union and the Polish exile government in London opened in late July 1941, about a month after the Nazi attack. By mid-August the Soviets had agreed to release Polish military prisoners who volunteered to fight against the Germans. However, they soon refused to allow these soldiers to head to Britain to join the exile units formed there — Josef Stalin would only open the gulag gates to provide soldiers for his own needs. About 115,000 Poles, including women, children and non-combatants, were eventually released to join Gen. Wladyslaw Anders' army. Anders formed three infantry divisions, training at first near Orenburg and then moving to Tashkent in Central Asia. After long political wrangling, in the summer of 1942 Stalin finally agreed to allow the Poles to move to Iran as part of the Allied occupation force there. From Iran, they soon moved to Iraq and came under British command. 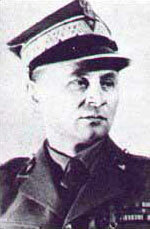 Bronislaw Duch commanded the 3rd Carpathian Rifle Division. Now styled the Polish II Corps (Polish units in the United Kingdom made up the I Corps), Anders' troops were scattered in training camps across Iraq and Palestine. Welcome reinforcement came with the addition of Col. Stanislaw Kopanski's seasoned Carpathian Brigade, which had been fighting alongside the British in the Western Desert. But Stalin shut off further access to the Poles imprisoned and exiled in the Soviet Union after the London government-in-exile began asking pointed questions about the fate of some 15,000 missing Polish officers. The controversy over the Katyn Forest massacre died with Gen. Wladislaw Sikorski, head of the exile movement, in a mysterious plane crash at Gibraltar. But Stalin had no intention of feeding more men to a movement that had shown its hostility to the Soviet Union and that his propaganda organs now labeled as sympathetic to the Nazis. Anders and his staff had estimated that at least 300,000 men could be raised from the Soviet camps, even given strict Soviet limits on recruiting Ukrainians, Byelorussians and Jews who had been Polish citizens in 1939. Now these men would be funneled into Stalin's own Polish exile army. Nikodem Sulik led 5th Kresowa Infantry Division. The loss of these potential recruits greatly upset Anders' plans. Two infantry divisions had been formed, the 3rd Carpathian on the basis of Kopanski's brigade and the 5th Kresowa built around the staff of the 5th Division originally organized in the Soviet Union. Each had two infantry brigades, with skeleton staffs of their third brigades awaiting further influxes of manpower from the gulags. In addition, an armoured brigade had begun formation (with all of 10 tanks), along with an independent infantry brigade that was to become the basis for a third division. Anders also lost a number of Jewish soldiers. As his troops remained in their camps and away from the front lines, discipline began to break down and anti-Semitic disturbances erupted among the troops. The corps included about 4,500 Jewish soldiers, and in addition about 1,500 Jewish civilian refugees — half of them children — had accompanied them on their trek out of the Soviet Union. During the Poles' stopover in Tehran, Iranians had stepped forward to help the children on their exodus, smuggling them into Palestine by sea. The majority of the Jewish soldiers — including Israel's future Prime Minister Menachim Begin — deserted to sneak into Israel, prompting British outrage when Anders refused to pursue them. Polish machine gunners at Monte Cassino. Without the additional recruits, and the officers massacred at Katyn and Tula by the NKVD, both divisions were below their authorized strength and the British were reluctant to commit them to combat. Instead the Poles helped garrison Iraq against a potential German breakthrough in the Caucasus. Both Polish divisions lacked all of their artillery, mortars were in short supply, and all units had a shortage of personnel. Anders furiously rejected suggestions that his corps be broken up and attached to British and American divisions in battalion-sized units, but attempts to make up the manpower shortage with recruitment among Polish communities in Canada and the United States failed miserably. Instead, Anders proposed to send his corps into battle without a pool of replacements: the Poles would take the manpower to replace their losses and flesh out their incomplete divisions on the battlefield. Large numbers of ethnic Poles had been impressed into the Wehrmacht as "Category Three" ethnic Germans; though officially these people were supposed to be ethnic Germans, Nazi officials faced enormous pressure to recruit anyone who looked vaguely Germanic in order to make good the German Army's own manpower shortages. Some of these Aryan conquerors spoke no German at all, and Anders believed they would gladly join their own side if given the chance. The Poles also had intelligence indicating that tens of thousands of Polish prisoners of war had been sent to Italy to labor on various projects. These men could also be freed and put back into service. Shermans of the Polish 4th Armoured Regiment in San Giorgio, 1944. Though uncomfortable with the plan, the British finally agreed to declare the corps combat-ready and in June 1943 Anders' troops were ordered to make ready for action. The 3rd Carpathian Division moved to Italy in December 1943, entering combat along a quiet sector of the front along the Sangro River. Corps headquarters followed in January 1944, 5th Kresowa Division in February and the armoured brigade in April. In May they moved up to Monte Cassino, where they took the monastery after American, British, Indian and New Zealand troops had failed. Afterwards the Polish corps fought up the length of Italy to the Po Valley. Polish troops did not participate in the invasion of Sicily, though they were certainly fit for combat. Kopanski's brigade had participated in action as early as 1941 against the Italian 17th "Pavia" Infantry Division, causing some consternation in the exile movement as Italy and Poland were not formally at war. That clash could be written off as the fortunes of war, since those Italian troops were formally under German command. But an invasion of Italian sovereign territory was a much stronger step, and a number of Polish politicians shied away from such involvement. Once Italy surrendered in September 1943, the way was clear for Polish involvement on the peninsula. For Daily Content variants, we're not required to give the fascists the same consideration; fascists deserve none. We can add the Polish II Corps to our Bitter Victory game as optional reinforcements on the 2-3 August turn. The Allied player rolls one die; on a result of 5 or 6 all five new Polish units are available. You can download the new Polish units here. Click here to order Bitter Victory now!